Firecracker Salmon. Sabrina S. Baksh/Regarding BBQ Inc. This salmon is marinated in an Asian-style mixture with just enough spice and heat to give it a little kick. Perfect for any occasion and a great way to spice up a healthy choice. Serve with grilled vegetables, brown rice, or quinoa. Combine marinade ingredients in a small bowl until sugar and salt have dissolved. Place salmon in a large resealable bag (or two, if needed). Pour marinade mixture over top, making sure fish is well coated. Place in the refrigerator to marinate for 1 hour. 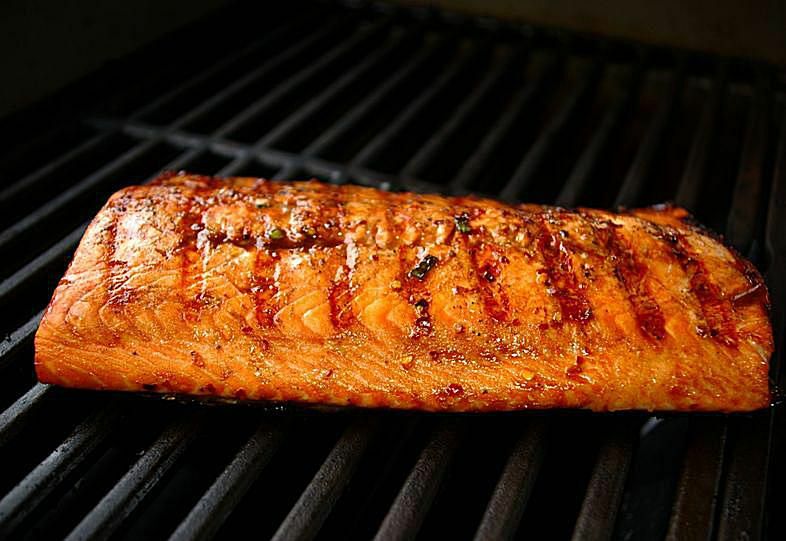 Make sure to oil the grill grates well before grilling fish. This will keep the fish from breaking during the cooking process. Brush liberally with some of the marinade and discard the rest. Cook over a high heat for about 4 to 5 minutes per side or until done (between 145-150 F.). Time might vary because of the thickness of the fish. Once fish has cooked, remove from grill and serve with your favorite sides.